Jacques de Chambly (died 1687) was from a French military background and became a seigneur in the New World and a governor of Acadia. Chambly's arrival in New France took place in 1665 when he arrived as a captain in the Carignan-Salières Regiment. He immediately was in charge of the construction of Fort Saint-Louis (now known as Fort Chambly) on the Richelieu Rapids. He then took part in the Prouville de Tracy’s expedition against the Iroquois. When his regiment was disbanded he returned to France but returned to service in Canada in 1670. In 1672 he received a seigneury on the Richelieu River in present day Quebec, Canada. 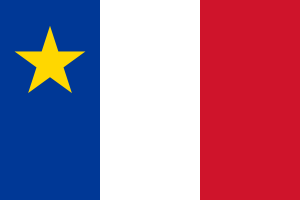 In 1673 he was appointed governor of Acadia, replacing Hector d'Andigné de Grandfontaine at the capital of Acadia, Fort Pentagouet. Baudry, René (1979) . "Chambly, Jacques de". In Brown, George Williams. Dictionary of Canadian Biography. I (1000–1700) (online ed.). University of Toronto Press.